Australia’s defence and security: are we doing enough? One of the proudest boasts of the Coalition government is that it takes national security seriously, and it does. Over the next 10 years, Australia will spend $200 billion on defence in the nation’s largest ever peacetime rearmament program. As the federal election looms, it is fair to ask why we are doing it and what are we getting for it. In simple terms, we are rearming because the strategic environment has changed dramatically, especially in the maritime domain. Almost half of that $200 billion is earmarked for the navy, $90 billion of which will go to building 56 warships in Australia. Unfortunately, the build won’t be complete until the mid-2050s. Geography means that Australia’s livelihood is tied to the sea, with our security and prosperity dependent on access to the Pacific and Indian Oceans. Our exports must travel by ship to reach their destinations, and we rely on the sea lanes to import liquid fuel and other vital goods. Australians tend to pay little attention to this simple fact because we have seldom had reason to. We have always allied with ‘great and powerful friends’ that could be counted on to keep our sea lanes open. Initially, the Royal Navy was Australia’s guarantor. Then the US Navy took its place—and in the 75 years since World War II, it hasn’t faced a peer competitor. But the strategic environment has changed. The US Navy, by its own admission, is not the globally dominant force we have long assumed it to be. Both warship numbers and capabilities are important, especially if you accept global responsibilities. In 1989, the US Navy had 594 combat ships. Now it has 275. The US plans to rebuild to 355 ships, but admits that this can’t be achieved within 30 years and that the overall cost will be a third higher than that of today’s navy. And recent US defence budget increases are unlikely to last. The US considers that the West is being challenged by four nations: China, Russia, Iran and North Korea. Both Australia and the US describe our regional geostrategic environment as the Indo-Pacific. Three of those four challengers are in our region. If things go bad, this has major implications for our region, our prosperity and our security. The biggest challenge for our region and the world is the emergence of China as a great power. China’s military is being restructured into one with a greater balance between its land, sea, air and rocket components, and we all know how good China’s cyber forces are. A major part of the restructure is the priority given to the People’s Liberation Army Navy. Recently, Chinese President Xi Jinping declared  that ‘the task of building a powerful navy has never been as urgent as it is today’ and urged  the PLAN to ‘prepare for war’. Chinese military leaders talk often and openly about the PLAN’s ambition  ‘to gain an ability like the US Navy so that it can conduct different operations globally’, and about how to defeat the US in the Pacific by sinking  its aircraft carriers. China is investing massive resources into the PLAN, which is growing rapidly in its size and sophistication. Analysis  from the Center for Strategic and International Studies shows that the PLAN already has more deployable vessels than the US Navy. In the past five years, China launched more new vessels than the entire Royal Navy has. It was able to do that through large-scale investment in dual-use shipbuilding facilities as the world’s largest commercial shipbuilder. 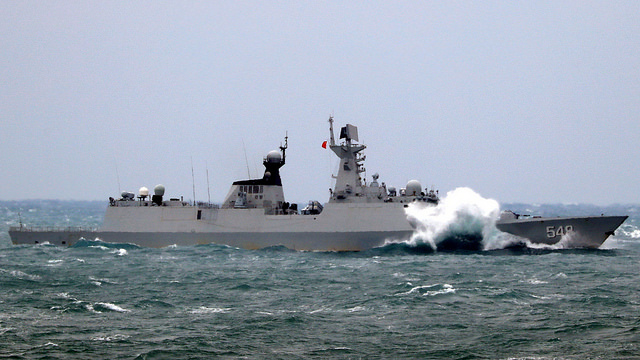 China is also developing larger, more advanced vessels capable of longer-range operations. China’s second—and its first domestically built—aircraft carrier will enter service soon. It’s been suggested  that the PLAN could eventually field up to six increasingly sophisticated carriers. China is also commissioning new amphibious assault ships capable of transporting marines and helicopters. A new line of cruisers, similar to the US Navy’s Ticonderoga-class Aegis-equipped cruisers, is being launched, as are new models of destroyers, frigates, corvettes and submarines. These are all ‘comparable in many respects to most modern Western warships’. We are witnessing the birth of a Chinese ‘blue water’ navy that will be able to conduct operations far from China’s coastline. This is not about the South China Sea or other territorial waters claimed by the PRC. It is driven by a desire to project power on a global scale. While he acknowledges that war is not inevitable, Graham Allison cautions  that ‘war between the US and China in the decades ahead is not just possible but much more likely than currently recognized’, and that ‘by underestimating the danger … we add to the risk’. Over the last 500 years, there have been 16 occasions when a rising power has overtaken the dominant power. In 12 of them, war was the result . It is dangerous to think that the US still dominates the world as it once did, given its global responsibilities, its diminished defence capability, its unpredictable national decision-making and the increasing strength of those that challenge it. This has monumental implications for Australian security when the US is still seen as the ‘centre pole’ of our defence. The Coalition government’s spending on defence is wise, but a root-and-branch analysis resulting in an Australian national security strategy is the only way that Australia can assess whether our spend is enough, whether what we are buying is appropriate, and if we can afford to wait decades to rearm our military to deter conflict. The last thing we need is a new defence white paper. That would merely delay important decisions that are required now. Given that anything in Australian defence takes decades to mature, an upcoming election is the perfect time to talk about the issue of defence and security. Jim Molan is a Liberal senator for New South Wales. He was a major general in the Australian Army and served as chief of operations for the Multinational Force in Iraq from 2004 to 2005. Image courtesy of rhk111 on Flickr.